(Anaglyph 3D and standard images to be viewed as a large size projection with & without 3D glasses) 45 min. ca. 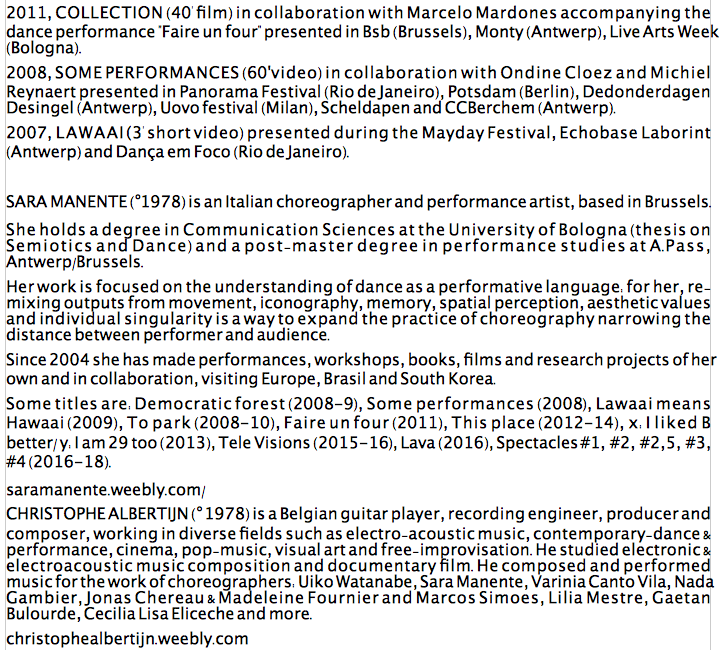 Spectacle #4 is a film treating the relation between dance and language as a fiction in four chapters. Using the literary form of EKPHRASIS, the description of an art work imagined or existed but not physically present, the film started from a series of interviews displaying how we do or don't talk, understand and remember a performance. As ridiculous and poetic as it may sound, we literally put words on dance and vice versa to semioticize and desemioticize at the same time. Conscious of the lack of transparency in relation to translation, especially from one medium to another, we choose film to convey the complexity of the topic in a rather excessive and sensual way. We use a DIY 3D technology which actually doubles the image, creating space in between two surfaces and adding virtual perspectives. We work vertically by piling up images and voices, not for the sake of accumulation but rather with the aim of peeling off or shedding the skin. With: David Bernadas, Mari Matre Larsen, Jaime Llopis, Norberto Llopis Segarra, Arantxa Martinez, Béatrice Balcou, Sabine Macher, Muna Mussie, Alix Eynaudi, Alice Chauchat, Trond Reinholdtsen, Maria Teresa Polverelli, Leif Elggren, Marco Berrettini, Béatrice Collignon, Silvia Fanti, Daniele Gasparinetti, Ottavia Guarese, Pietro Bertazzo, Helena Dietrich...i.a.